The areas of white collar defense practice listed below are representative of the types of criminal laws we focus on. For more information on the results we have secured for our clients, you can review our Case Studies. Regarded as one of the preeminent criminal defense lawyers in the nation, Michael D. Monico, along with his law partner, Barry A. Spevack, together have over 35 years of experience successfully defending individuals and corporations in complex white-collar cases. Their firm, Monico & Spevack, is known nationally for its vigorous and innovative defense of high-profile clients who are the targets of criminal and regulatory investigations into offenses involving public corruption, antitrust, mail, wire, health and securities fraud, money laundering and foreign corrupt practices, among others. A boutique firm, Monico & Spevack can provide each of its clients with hands-on representation. All of the attorneys work together as a team on each matter in order to provide efficient and effective representation utilizing each lawyer’s in-depth skills, knowledge and experience. 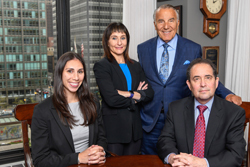 As former prosecutors with the United States Attorney’s Office and the Securities and Exchange Commission, respectively, Mr. Monico and Jacqueline Jacobson understand fully prosecutorial and regulatory enforcement strategies and are highly effective at negotiations that settle charges for their clients short of indictment. If trial is unavoidable, Mr. Monico has an exceptional record of securing jury verdicts or reduced or probationary dispositions for their clients. Monico and Spevack lawyers also possess the insight necessary to conduct sensitive internal compliance investigations and recommend the right course of action to resolve issues or anticipate enforcement proceedings. In order to provide its clients with the highest level of representation, the firm’s attorneys devote considerable time to developing their skills and knowledge. Senior partners Michael Monico and Barry Spevack have written the only treatise on federal criminal law in the Seventh Circuit, Federal Criminal Practice: A Seventh Circuit Handbook. They have lectured or participated on panels discussing issues of interest to the criminal defense bar throughout the country, and Mr. Monico’s peers have selected him to leadership positions in several national criminal defense organizations. U.S. News & World Report and Best Lawyers named Monico & Spevack a Tier 1 firm in Chicago for Criminal Defense: White Collar in its annual “Best Law Firms” publication for 2014.